Fired FBI Director James Comey arrived on Capitol Hill Thursday to deliver what’s been billed as the most highly anticipated congressional testimony in history and that’s hardly an embellishment. Much of what Comey has to say is described in his written testimony: President Trump urged him to kill an investigation into the conduct of former national security advisor Michael Flynn. Trump persisted in demanding the director’s personal devotion. And he repeatedly directed Comey to publicly clear his name—which is a little ironic since the pretext for firing the director was that clearing Hillary Clinton was a wildly improper thing to do. Flynn, a volatile conspiracy-theorist, is today all but cooked. Last month, federal prosecutors issued grand jury subpoenas for his business records. He’s been grasping for immunity since March. Oh, and he was forced to resign from office—for the second time—after lying to the vice president about the substance of five phone calls he placed to a Russian envoy the day the US retaliated for Moscow’s interference in the election. Make no mistake: Trump’s expectations of loyalty posed a significant threat to the politically-neutral foundation upon which the FBI must operate to survive—that is if the Bureau plans to avoid falling back into old patterns of criminality not seen since COINTELPRO. Remember, US presidents from FDR to Nixon routinely directed the FBI and other intelligence agencies to slander and wiretap and even burglarize their political foes. The FBI itself has even been the target of White House sabotage; it was Nixon, after all, who directed the CIA to obstruct its Watergate investigation. While today there are oversight mechanisms in the form of committees and secret surveillance courts, the reality is the Bureau simply can’t afford another Lyndon B. Johnson. While Comey may pull punches so as not to jeopardize the ongoing Russia probe, he may yet reveal details not contained in his written testimony. (His firing, for instance, is not mentioned at all.) But when the dust settles and Comey returns to Virginia and his new almost-quiet life, one question above all will demand a swift response: Did Donald Trump, the president of the United States, try to browbeat and cajole the FBI director to obstruct the course of justice? Update, 10:18am: The hearing has begun. In the gallery behind Comey, there’s Preet Bharara, the former US Attorney for the Southern District of New York. He is also a member of the Fired By Trump Club. Chairman Richard Burr, Republican of North Carolina, opened the hearing by thanking Comey for his service. He said Comey’s statement provided “texture and context” outlining a “strained relationship” between Comey and the President. He notes, twice, that Comey’s story is only how events occurred from his perspective. He says Trump’s version of events needs to be told, too. Update, 10:23am: “Director Comey, you’re now under oath,” Burr says. Comey has the floor. Comey has decided not to read his written testimony, which was released yesterday, but instead offers a few opening remarks. Comey says he always understood that he could be fired on a dime, serving at the “pleasure of the president.” Comey said he was confused to see Trump on TV saying he fired him because of the Russia investigation. Update, 10:31am: Burr asks him if he believes the Russians led cyberattacks against the US during the campaign. Comey says they did. Burr asks if he believes the Russians altered any votes. Comey says he does not believe votes were altered. Burr asks if Comey believes Trump was trying to obstruct justice by asking him to back off Flynn. Comey declines to speculate. When Burr asks if the FBI might discover criminality or coordination with the Russians that isn’t tied to the 2016 elections, Comey says acts of “a criminal nature,” unrelated to the subject of the investigation may come out. 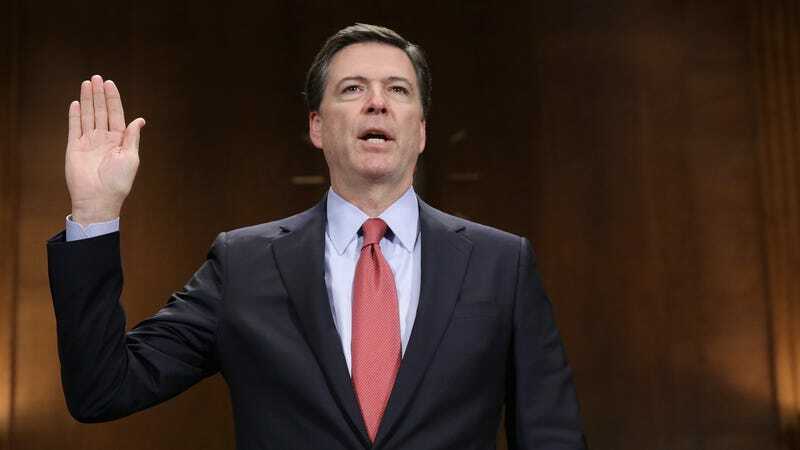 Comey says he felt it was necessary to tell Trump that he wasn’t the subject of a “counterintelligence investigation.” He previously said he was hesitant to announce publicly that Trump wasn’t specifically a target because that could change and create a situation where FBI would have to correct itself before the public. Comey describes the “patronage relationship” Trump was trying to pull him into. He says that despite having discussed staying on and assuring the president he wasn’t leaving, Trump continued raising the idea that Comey might not stay. It seemed, he said, that Trump was “looking to get something in exchange” for his job. When Trump asked Attorney General Sessions to leave the Oval Office so he could speak with Comey alone, Comey says he knew “something big was about to happen.” He remembers thinking, “I need to remember every word that is spoken.” He says it seemed like both Sessions and Kushner picked up on how strange it was for Trump to ask to speak to Comey privately. “You don’t know anyone who’s ever been charged for hoping something?” Risch asks. Comey says he does not. Update, 11:03am: Sen. Dianne Feinstein, Democrat of California, takes over. She asks why Comey thinks he was fired and asks if it was because of the Russia investigation. “Yes,” it was because of the Russia investigation, Comey says, “because I’ve seen the president say so.” Comey is referring to Trump’s public remarks that the probe was on his mind when he decided to fire him. When Comey told Trump he would “see what he could do” about clearing the president’s name, that was a “slightly cowardly way” of getting out of the conversation, Comey admits. The FBI leadership was shocked, he says, when Comey told them that Trump had requested an end to the investigation into Flynn. They considered who to tell, but decided there were no Senate-confirmed leaders in the DOJ, other than Sessions, who was about to recuse himself. Update, 11:10am: Sen. Marco Rubio, Republican of Florida, asks Comey if Trump requested more than the investigation into Flynn be dropped. He answeres no. Update, 11:17am: Sen. Ron Wyden, Democrat of Oregon, takes over. The timing of Comey’s firing “stinks,” he says. Regarding the recusal, Comey says he isn’t sure why Sessions was involved in his firing—if the reason he was fired was the Russia investigation, as the president suggested publicly. Update, 11:17am: Sen. Susan Collins, Republican of Maine, takes over. She asks when Comey told the president he wasn’t under investigation if he specified “counterintelligence investigation.” She also asks if when FBI told congressional leadership Trump wasn’t under investigation, his remarks were limited to a “counterintelligence investigation.” Comey says he didn’t use specific words to conceal a criminal investigation into the president. “It was important for me to assure him that we weren’t investigating him,” Comey said. Collins wonders why Comey told Trump “Flynn was a good guy,” during the request to back off Flynn, but doesn’t follow up with a specific question about the remark. Comey says he spoke to the attorney general and the deputy attorney general about Trump kicking everyone out of the Oval Office to talk to him privately. He says he conveyed that was inappropriate and never should have happened. Collins asks if Comey also told the attorney general if Trump asked to drop inquiries into Flynn’s activities (Comey wrote specifically in his opening remarks that he did not.) He says no. Collins asks if Comey showed his memos to anyone outside the DOJ. Comey says he showed a copy of the memo to a friend of his—“a professor at Columbia Law School”—who then showed it to a reporter. His decision to do this followed Trump’s tweet indicating there might be “tapes” of their private conversation. “When looking at any witness you look at consistency, track record, demeanor, record over time, that sort of thing,” Comey adds. Comey says that he did not write all of his memos intentionally in a way that would keep them unclassified. The first meeting he says, which took place at Trump Tower, was detailed in a memo in a classified system. Blunt asks what the difference is between Comey being on the phone with Trump alone and being in the room alone with him. Comey says he did have phone conversations with Trump after asking the attorney general to prevent further direct contact between them. Blunt asks what memo Comey specifically gave his friend. He says it was the memo about his dinner where the president asked for his loyalty. Blunt asks if he then thought the memos were his personal property, as opposed to government documents. Comey says that memo, in particular, belong to him as a private citizen, but the classified documents obviously do not. Blunt lightly chides the former director for giving the memo to a friend to leak to the press. Update, 11:47am: Sen. Angus King, Independent of Maine, takes over. He asks if the Russian attacks were a one-time thing. It’s a “long-term practice of theirs,” Comey says. “They’ll be back.” King says the Russia probe is a “forward-looking investigation,” meaning they are preparing for future attacks. Comey agrees, saying: “It’s not a Republican thing or Democrat thing. It’s an American thing.” King adds that he doesn’t think Putin is a Republican, “he’s an opportunist.” Comey agrees. Comey says the night that Trump called to invite him to dinner, “around 6pm,” he had to cancel a date with his wife. “That’s one of the all time great excuses,” King says. In retrospect, Comey says, he wishes he’d kept the date with his wife. There’s laughter in the gallery. “That’s one questions I’m not going to follow up on,” King jokes. Comey declines to say in an open setting whether Flynn is central to the Russia investigation. Responding to a question, Comey also says Sergey Kislyak is “a diplomat” who works within a “robust” intelligence organization, but that he doesn’t consider Kislyak to be an intelligence officer. Update, 11:56am: Sen. James Lankford, Republican of Oklahoma, takes over. He asks Comey if the director of national intelligence, or the NSA chief, or anyone in the White House ever asked him to drop the Flynn investigation. Comey says no. He also reiterates that Trump only asked him to do so in the one Oval Office meeting where Sessions and Kushner were asked to leave the room. Lankford asks if Trump could simply kill the probe if he wanted. “I’m not a legal scholar,” Comey says, but says, in theory, the president has the legal authority to start or stop any investigation, he says. “I supposed if he wanted to issue a direct order, he could do it in any way,” through the attorney general or directly to the FBI. Lankford notes that Trump has repeatedly said he’s not fond of the investigation, but seems to be pushing the point that Trump has not taken unilateral action to kill the Russia probe. Comey acknowledges the difference. Lankford turns his attention toward the Clinton campaign and asks about instructions from DOJ to call the investigation into Hillary Clinton’s emails “a matter” instead of “an investigation.” Comey says that gave the impression publicly that Attorney General Loretta Lynch was trying to align with the campaign. “That gave me a queasy feeling,” he said. Manchin asks Comey if he thinks he would have been fired if Clinton had won. “That’s a great question.” He then repeats several times, “I don’t know.” 2016 was a “painful time,” he says. Sen Tom Cotton, Republican of Arkansas, takes over. He says Comey encouraged the president to release his tapes; would he would also encourage his friend at Columbia and the DOJ to release his memos? Comey says he would. Cotton raises The New York Times story that claimed Russia intelligence officers had repeated contacts with Trump campaign aides. Comey agrees the story is “entirely wrong.” Cotton turns attention to Flynn and his conduct, his alleged interactions with the Russian ambassador during their five phone calls in December. A story in the Washington Post said FBI reviewed Flynn’s calls and said nothing was illicit. Comey refuses to confirm or deny whether that story is accurate. Comey is refusing to answer a slew of Cotton’s questions due to the public setting. Cotton indicates he will ask Comey again in a classified setting. Comey declines, for instance, to say whether the FBI ever came close to closing the book on Flynn. Update, 12:19pm: Sen. Kamala Harris, Democrat of California, takes over. Comey and Harris exchange pleasantries. Comey jokes that he’s “in between opportunities right now,” which draws laughter from the gallery. Harris asks if Comey is aware of any meetings between Trump campaign officials and the Russians that have not been reported. Comey says he can’t answer in an open setting, even if he remembered the answer. Comey declines to answer as well whether he’s aware of any efforts by the White House to destroy documents related to the investigation. Harris asks what mechanisms were in place to make sure Sessions wouldn’t get involved in the investigation after recusing himself. Comey says he doesn’t know specifics but believes ethics attorneys were involved. Comey reiterates that he isn’t really sure why Sessions was involved in his firing. “I just don’t know the answer,” he says. Comey also says he isn’t sure whether Sessions had access to investigative materials after or during the period in which he was recusing himself. Regarding the loyalty pledge, Harris asks if Comey knows if Trump ever asked any other federal employees to take the same pledge. He says he can’t confirm one way or the other. Following the tarmac meeting, Comey said he considered calling for a special counsel. “I knew there was no case there,” he says. “Calling for a special counsel would have been brutally unfair.” Comey acknowledges the major disagreements over the outcome of that investigation. Sen. Jack Reed, Democrat of Rhode Island, takes over. He begins by asking about reports about National Security Agency Director Adm. Rogers and Director of National Intelligence Daniel Coats being asked by the president to help clear his name. “I had no contact with any of those leaders about that subject,” Comey said. Comey says his promise to give the president his “honest loyalty” after being asked for “loyalty” was a way to end an awkward conversation. Comey says he is not sure if he was fired because he refused to drop the Flynn investigation, only that the president has indicated it was because of the Russia investigation in general. It appears to Comey that he was fired in order to “change” the way the investigation was being handled. “On top of that, the Russia investigation is vital because of the threat,” he says. If any Americans helped the Russians, Comey adds, “that is a very big deal.” He says the special counsel will likely uncover proof of that, if it exists. Sen. John McCain, Republican of Arizona, (ex officio) takes over. He asks Comey to differentiate between the Clinton investigation, in which he said there was insufficient evidence to bring a suit, and the Trump investigation. Comey says the Clinton investigation was done as of July 5th and that’s what he was announcing. McCain says in his mind there are still lingering questions. “I think the American people have a whole lot of questions out there,” he adds. McCain seems to be implying that the Clinton campaign may have been involved somehow with the Kremlin—or maybe not? Comey says there’s no evidence to support that. McCain says he thinks it’s a “double standard.” There’s laughter in the gallery. Update, 12:46pm: Hearing adjourned. The Senators will head into a closed session with Comey. President Trump did not tweet once. Correction: A previous version of this article identified Joe Manchin as the US Senator from Virginia. He is a Democrat of West Virginia. We regret the error.